duh, duh....duh, duh....duh, duh... OH NO!!!!!!! After a recent trip to the Air and Space Museum had me laughing hysterically at the shark repellent displayed in a U2 pilot survival kit, I did the natural thing and googled it. I was seriously surprised by what I found. So, in honor of Shark Week - the annual holiday as declared by Discovery Communications - I wanted to harp on some seriously suspect physics I noticed while looking up shark repellent bat sprays. Two separate devices I found are being sold to this effect and from the looks of it, people are really buying. The first, called Aquashield, is using physics that seems about as likely to save you from a great white as a magnetic bracelet is to save you from Magnetic Field Deficiency Syndrome. And as near as I can tell from their Wikipedia regurgitation of irrelevant facts and the following email correspondence, it is a magnet. "Thank you for your interest in the Aquashield unit. Yes you are correct, the unit utilizes integrated magnetic technology as part of the process to achieve this excited state of electrons. The flow through ports allow for the ionization process to take place. The field arrangement is such that the exothermic polymer allows for a stabilized field state so this field structure is never compromised. There are 24 sequential magnetic points that deliver this field state. The magnet belt-buckle does have a pretty sweet logo on it, and if I were a hipster I might procure one just to put all other hipster belt-buckles to shame. It's funny at first and then you realize people are actually thinking this makes them safe. Snake oil is one thing, but if you sell someone snake oil the risk of it not working doesn't involve being eaten by a snake. 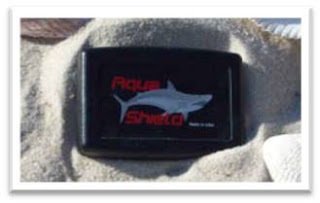 The other similarly named device, called Shark Shield, is at least more active, though $500 more expensive. This one supposedly works by sending out an electromagnetic wave that causes uncontrollable muscle spasms in any shark in your area. Sadly, a person was actually killed while wearing the device several years ago according to this article. Also, according to the same article a raft in South Africa was moving along with the Shark Shield attached to it when a 12 foot shark came up and ate the device. One interesting thing about this though, is that sharks really do have the ability to detect electrical impulses. 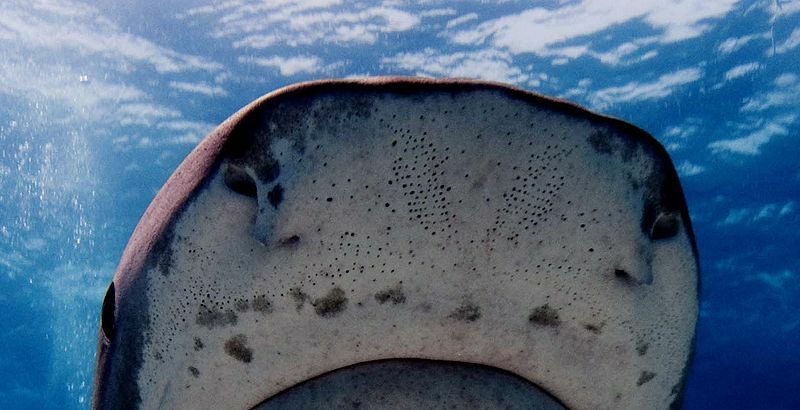 Sharks - as well as stingrays and some other aquatic creatures - have a number of electroreceptors in pores on their heads called ampullae of Lorenzini. This is how they hunt and possibly how they can navigate such large distances. Does this translate to a shark being repelled by a magnet or an EM field? Neither company presents very compelling evidence. Shark Shield is supposed to cause uncontrollable muscle spasms in sharks, but in none of the videos posted on their website did I see that happen. Just because you survived a shark swimming near you doesn't mean the device worked. People swim by sharks all the time. They rarely attack. However, one good thing about working in a building full of physicists is that you always have materials on hand for experiments, yes even bountiful strong magnets and sharks. I think our experiment is about at the level of their science, but I'll let you be the judge. Clearly the results of this experiment show that a Bala shark would be no less likely to eat you if you were wearing magnets. If the maker of either of these products cares to post any sort of evidence for the validity of their products, I more than welcome it. Physics Buzz: We put magnets in a fish tank with our boss' Bala Sharks, you decide. Thanks for exposing the Aquashield for what it is - snake oil! His explanation is word soup and makes no sense. I feel you should get back to the task of playing with yourself instead of this fish tank. talk about sucking the fun out. it's a joke guy. I've seen the Aquashield main page. Interestingly, there is no video showing a shark being repelled. You would think that would be something easy to set up in Florida. I don't see why some are amused by this article, as there's nothing to laugh. I don't know how well documented is this article but as a general idea when you enter an environment you weren't natively built to live in it, like oceans or seas, not only that you're far bellow from the top of the food chain, but you're also very unadapted to survive in those conditions. You always have to be prepared for the worst case scenario. Don't bet everything on a electric pulse emitting device that might or might not affect the shark. If the shark approaches you more than you feel secure than it's time to go out of the water.That electric pulse emitting device can at least been seen as an insurance the shark won't go straight for the bite as it slightly makes a shark feel uncomfortable, so don't risk your life and limbs betting everything on a device, 'cause nature as a whole is filled with uncertainities, and it can't be totally controlled even with this days technologies. Respect the shark as a top predator of the seas, and when it happens to share the same environment be cautious. Don't swim in deep waters where you can't see the bottom or there's a low visibility. Don't make surf a daily practice 'cause there's only a matter of time until a close encounter with a shark. When you're scuba diving in waters where shark presence is imminent educate yourself in a 360 degrees awareness, and if it happens to spot a shark keep a safe distance, when that distance narrows it's time to get out of the water. Please send me a copy, for I only am able to enjoy my DIY electronics hobby. seriously - check the youtube for aguashield and you will see how it fails - it does not repels the sharks away - and my close friend who lives in Florida had a chance to test them with reef sharks and they dont seem to be bothered - the bait attached to the pole with tuna head was attacked by several black tip reef sharks - so I wont bother to even think about buying this "aquashield"
Bala sharks are not sharks and do not use electroreception more than any other non-shark fish so what is the point?